I love using whites especially when you want to make elegant cards for wedding or for those romantic moments. Combine them with pastel colors with just a touch of darker shade in focal point and they give a dreamy look. 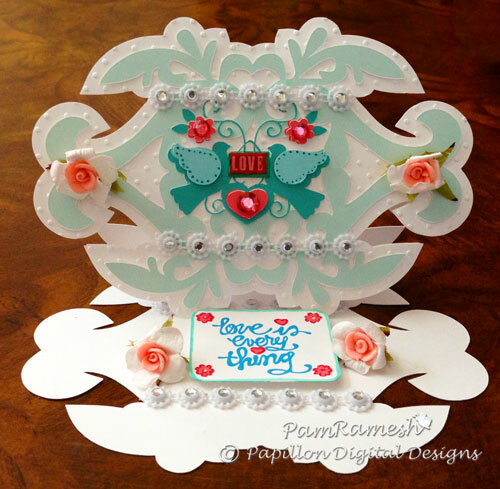 I embossed the front piece with cuttlebug swiss dot folder. The dove image is also a silhouette cut file and so is the sentiment. I added some flowers and a rhinestone ribbon. I added a Love sticker from studio G in the center between the doves. Love silhouette for how intricately it cuts. Hope you enjoyed this. Do share your creation with us. Thanks Sheila for having me here. and then welded to make a card . I scored the card'd front in half to make and easel card. I also used another image dove - http://www.silhouetteonlinestore.com/php/?page=view-shape&id=34654 for the focal image. You did a great job in creating that. Love it! This is just gorgeous Pam !